This paper examines the impacts of the affordable care act (ACA)—which substantially increased insurance coverage through regulations, mandates, subsidies, and Medicaid expansions—on behaviors related to future health risks after 3 years. Using data from the Behavioral Risk Factor Surveillance System and an identification strategy that leverages variation in pre-ACA uninsured rates and state Medicaid expansion decisions, we show that the ACA increased preventive care utilization along several dimensions, but increased risky drinking. These results are driven by the private portions of the law, as opposed to the Medicaid expansion. We also conduct subsample analyses by income and age. The online version of this article ( https://doi.org/10.1057/s41302-018-0119-4) contains supplementary material, which is available to authorized users. Cotti, Chad D., Erik Nesson, and Nathan Tefft. 2018. Impacts of the ACA Medicaid expansion on health behaviors: Evidence from household panel data. 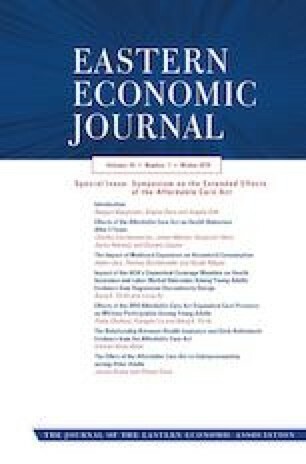 Available at SSRN: https://ssrn.com/abstract=2989323. Kaiser Family Foundation (KFF). 2014. State Decisions on Health Insurance Marketplaces and the Medicaid Expansion. http://kff.org/health-reform/state-indicator/state-decisions-for-creating-health-insurance-exchanges-and-expanding-medicaid/. Accessed 13 Sept 13 2018.